A new approach to understanding voter choice with important implications. There is a substantial class of voters who would like to do “good” but ignore important consequences of their attempts to do so—naïve altruists. The book both shows why such a class exists and tests the implications of that group’s behavior in a setting where other voters are self-interested, others are traditionalists, and imitation plays a big role in voter choice. The book also looks at the policy implications of such behavior accepting as desirable, but not fully achievable, the democratic ideal in which sufficiently informed citizens are given equal weight in political choices. Naïve altruists ignore the anti-growth consequences of redistribution from the rich as a class to the poor as a class. That ignorance produces too much of that redistribution in terms of the democratic ideal. Phillip Nelson has specialized in two fields. The first is information economics in which he has produced seminal work in consumer economics. 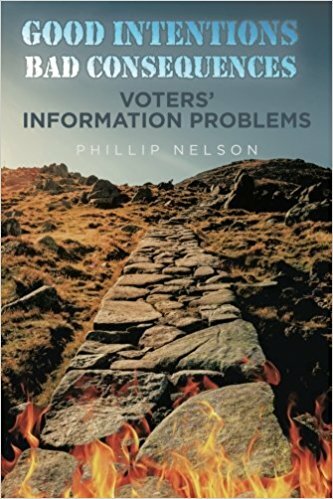 The second is public choice in which he has written many articles and the book, “Signaling Goodness.” This book melds these two fields producing new insights about voter information problems. He has spent a lifetime teaching graduate courses in these specialties and microeconomics theory at Binghamton University, Columbia University, and the University of Chicago.